Whenever a young player enters into a new league, it may be difficult for themselves to adjust to the new challenges that come with the brand-new environment. The NHL level is no different — save that everything’s amplified to remarkable intensity. However, luckily enough for the Colorado Avalanche, they have a veteran on the roster who may be able to help these young players adjust to the challenge of adjusting to the NHL level. After being added to the Colorado Avalanche at the waiver deadline last season, Mark Barberio was able to make an immediate impact on an otherwise lackluster Avalanche defense. He possesses a wider range of experience thanks to his tenure with the Montreal Canadiens and Tampa Bay Lightning — and he’s still only 27 years old. Barberio’s calm, composed play will prove valuable for the Avalanche in the coming season as they look to get back on track after their franchise-worst record last season. “It [experience] is something that comes with more time as being a professional; I don’t think that I was that poised my first few years in the AHL. Just reading the game well is something that will come to players as they gather experience,” Barberio said. 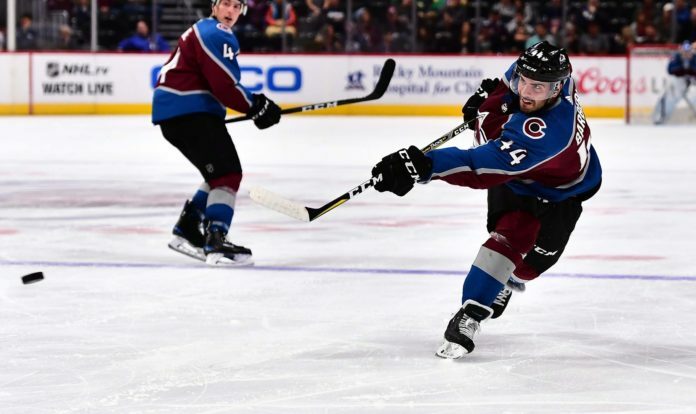 The Avalanche will have plenty of young defensemen who will be learning from Barberio, as one of the team’s only returning, veteran defensemen — along with Tyson Barrie, Erik Johnson, and Nikita Zadorov. In Zadorov’s case — he’s technically a veteran on this squad at the age of 22 — he still has plenty to learn about the league itself; making this season a perfect opportunity for him to progress in his own development. There are still four vacant positions left to fill for the Avalanche defense, and the front-runners to nab these spots are prospects Chris Bigras (22 years old), Duncan Siemens (24), Anton Lindholm (22), and Andrei Mironov (23). Bigras, Siemens, and Lindholm have spent the past few seasons with the AHL’s San Antonio Rampage. Because the skill level in the AHL is vastly different to the NHL, the two styles of play are fairly different. The pace is faster; the players more skilled. After spending plenty of time in the AHL himself, Barberio will be able to help this trio of youngsters adjust to the NHL. Things become a little more complicated with Mironov. For the past few seasons, Mironov has spent time in the KHL with the Dynamo Moscow. Mironov will have the largest learning curve, as he will need to get used to smaller rinks and a more physical style of play. For the sake of the Avalanche and their fans, the team is hoping that these young players will be able to adapt quickly and contribute. All of the team’s veterans will be tasked with helping them get up to speed, but Barberio’s uniquely equipped to mentor them.